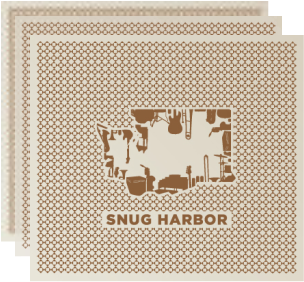 A tight set of modern funk from Snug Harbor – representing the contemporary northwest scene at it's finest – nicely raw and dexterously performed! Snug Harbor revels in a live feel here and that immediacy is truly infectious. There's some vocal numbers and instrumentals, generally rooted in funky soul, but there's some raw fusion jazz going on here, too, particularly in the the slightly roomier jams, which have space for the players to solo and do their things. Trumpet player Will Glazier doubles as vocalist, with some nice Hammond and Wurlitzer grooving, plus clavinet by Justin Smith, sax by Frank Vitolo, trombone by Daniel De Lisle, drums by David Lofgren, guitar by Mark Lorenze and bass by Steve-O Blair. Includes "Lucky's Uncle", "It Is What It Is", "Sean Song", "Maggot Rain", "Deal With It", "Palmyra Rain", "The Abominable Snow Flake", "Prove Me Wrong" and a really cool cover of Gene Ammons' "Jug Eyes". "Snug Harbor; Jazz, Funk, and Soul Grooves"
Drawing on jazz standards and contemporary local music, the initial members of Snug Harbor, as a quartet, released a demo recorded by Joel Ricci, and Mars Lindgren (Lucky Brown, Yogoman Burning Band) in their home studios in the York neighborhood under the moniker Apothecary House Band. Ricci has served as a mentor for the entire group at times, sharing his wisdom, outlook and understanding of the sacred music we play. Trumpeter, vocalist and band leader Will Glazier recalls his move to Bellingham, "Joel was my biggest inspiration. You saw him playing everywhere. His music is just so powerful you hear it echo throughout your core. I remember the first day I met him, he brought me inside his home, cooked me dinner, poured me some wine, and taught me an instrument I had never even played before. Then we recorded it." 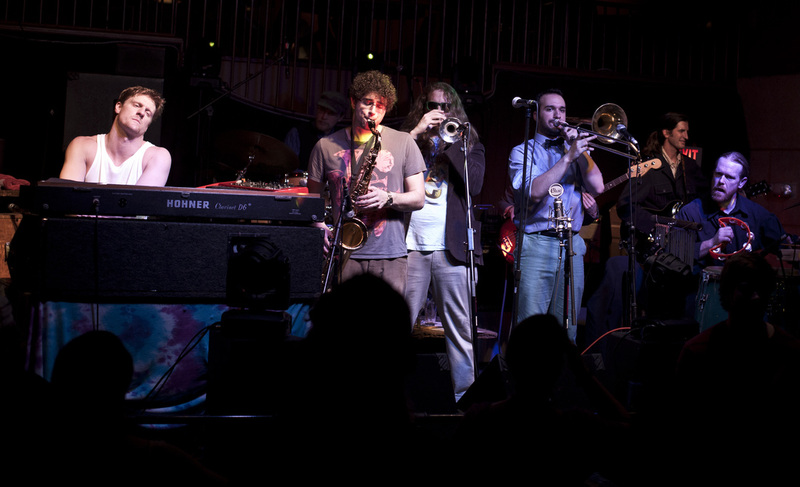 With another year under their belt, Snug Harbor thought of a way to preserve the raw sound of their live energy. Recorded live in-studio, "Sounds From the York”, their debut EP, was released on September 22, 2009, engineered by Chris Vita at Fairhaven Studio at Western Washington University. Very little post-production was spent on this album, with the intent on releasing a loose, organic and natural sound. The follow up to "Sounds from the York", is the self-titled album that was recorded Jan 7-9, 2011 at Fastback Studio in Seattle. "Snug Harbor" is the debut full-length studio album that includes variations on funk and soul based grooves. Filled with almost all original music and lyrics, this album captures Snug Harbor's reciprocal love for our community, arts and music. Caine from Coldnote appears as a guest vocalist along with Jun Nakamura as a featured soloist. Because of Snug Harbor's deep respect for Chris Vita, he was chosen to be the engineer again and also mixed the recording. Vita's skills, patience, and direction were essential to this album's success. 'Snug Harbor' was recorded using almost all vintage microphones, instruments and outboard equipment. The album was release on May 5, 2011 to a sold-out crowd in Bellingham, WA. The album's post production was produced 100% locally from the design, paper, ink and replication. Thank you to Bison Bookbinding and Letter Press, Andy Pritiken and Blank Studio, Gus Elg at Sky Onion Studio, Jason at Fastback Studio, Russ Fish from Fairhaven Studio, Vita Mastering, and the Wild Buffalo. The newest album, "This Is Snug", was recorded in February of 2013 at Fairhaven Studio. It was tracked, mixed and mastered by Spencer Bell of Top Shelf Audio. This EP contains four original songs and three live songs from Summer Meltdown '12 performance. It features our newest members Nick Taylor on bass and Joe Marx on percussion. We have new songs, members and shows unraveling as we speak- and so the next incarnation of Snug Harbor is here and ready to make a big splash.